It's often said that Jeep is the most valuable part of Chrysler, and the renewal of the legendarily tough utility brand's range is now well underway, courtesy of new owner Fiat. 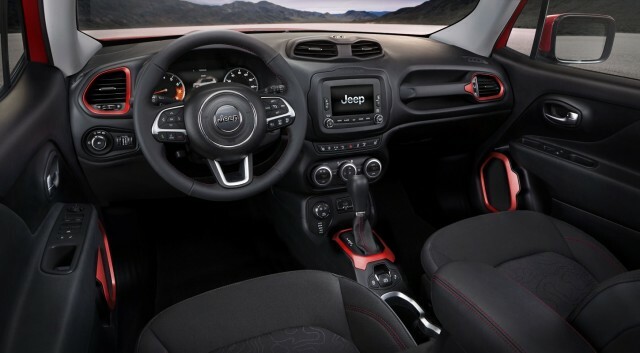 Introduced today at the Geneva Motor Show, the newest model is also its smallest modern-day vehicle ever: the 2015 Jeep Renegade is a subcompact crossover, though it's offered with a Trail Rated model called the Trailhawk, and a choice of two separate 4 x 4 systems for off-road ability. 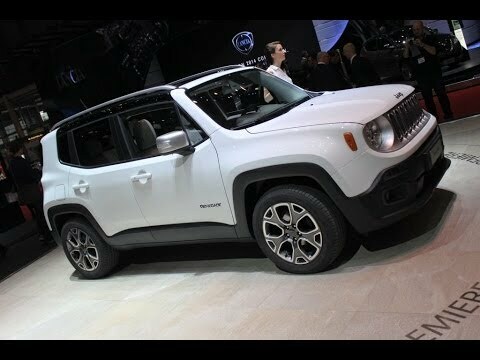 The Renegade is an upright four-door utility vehicle with a lifting rear hatch, measuring less than 167 inches long--only 7 inches longer than a Ford Fiesta hatchback. It will compete with the MINI Cooper Countryman, the Nissan Juke, and the Buick Encore, all of them upright subcompact cars with available all-wheel drive. It will offer some of Chrysler's newest powertrains, too, with two engine options: a 168-horsepower turbocharged 1.4-liter engine--the same one used in the Fiat 500 and Dodge Dart--that produces 184 lb-ft of torque. There's also a beefier 184-hp 2.4-liter four with a torque rating of 177 lb-ft, which is the one that provides towing capacity rated at up to 2,000 pounds. The smaller engine will be offered with a six-speed manual gearbox, the larger with the new nine-speed automatic transmission first launched in the Renegade's bigger brother, the 2014 Jeep Cherokee. Jeep didn't release predictions on fuel-economy ratings, but it's reasonable to expect highway ratings above 30 miles per gallon, despite the bluff, upright stance of the little utility vehicle. Front-wheel drive will be standard, but the two new 4 x 4 systems, two variations of Jeep Active Drive, default to powering the front wheels and disconnect the rear wheels and driveshaft altogether for better gas mileage. When wheelslip is detected, or drivers engage the 4 x 4 system, it can send up to 100 percent of drivetrain torque to any wheel as needed. The optional Jeep Active Drive Low system adds an additional 20-to-1 low-range mode for crawling. Both systems include Jeep's traditional Selec-Terrain feature, which lets a driver choose from five different modes (Auto, Snow, Sand, or Mud, plus an additional Rock mode on a Trail Rated Trailhawk model). 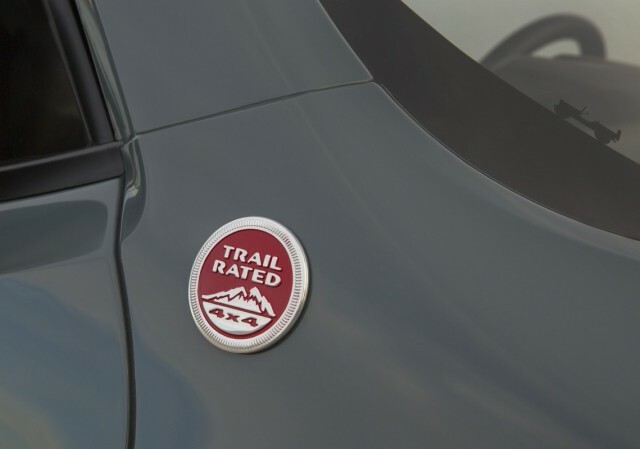 That Trail Rated model includes not only the extra mode to Selec-Terrain but also rides almost an inch higher and adds unique 17-inch all-terrain tires, a hill-descent crawl feature, skid plates, tow hooks, and different bumpers. Jeep has dubbed its latest design language for the interior Tek-Tonic, with rugged, functional controls surrounded by softer and more tactile shapes. Vents, the shift lever, door speakers, and other elements are outlined in bright contrasting colors. One notable option is a pair of removable roof panels, called My Sky, which open the interior to daylight to evoke the much more primitive experience of the original Jeep, now sold as the Wrangler. 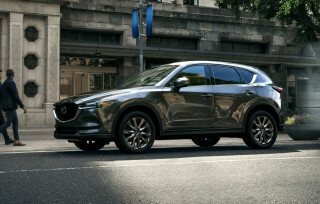 Infotainment technology includes digital instruments on some models, the Uconnect Access connectivity system with WiFi hot spot, and a suite of the latest safety systems, including lane-departure warning and forward-collision warning. Jeep expects to sell as many as 150,000 Renegades a year, reflecting increased global desire for all-wheel-drive utility vehicles even in the smallest sizes. Trim levels for the U.S. include Sport. Latitude, and Limited models, plus the top-level Trailhawk version. 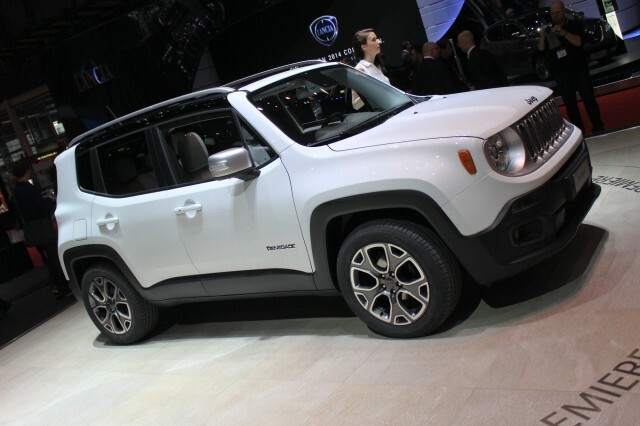 The 2015 Jeep Renegade will go on sale late this year. In another first for Jeep, it will be built in a Fiat factory in Italy and imported into the U.S.
For all the latest news, concept cars, and production launches from this week's show, see our Geneva Motor Show page.